AT&T’s (T) struggles have been notable, but the stock may finally be about to turn the corner and head higher. An analysis of the technical chart and the options market suggests the stock could be about to break out extending its recent gains to as high as $34.25. The last time I wrote about the stock was on January 30 when AT&T was Getting Crushed By DirecTV. At the time, I had thought the stock might retest its Christmas Eve lows around a price of $27.40. The stock never got close falling to a low of approximately $28.90. Now, the stock is nearing a significant region of technical resistance between $31.20 and $31.80. 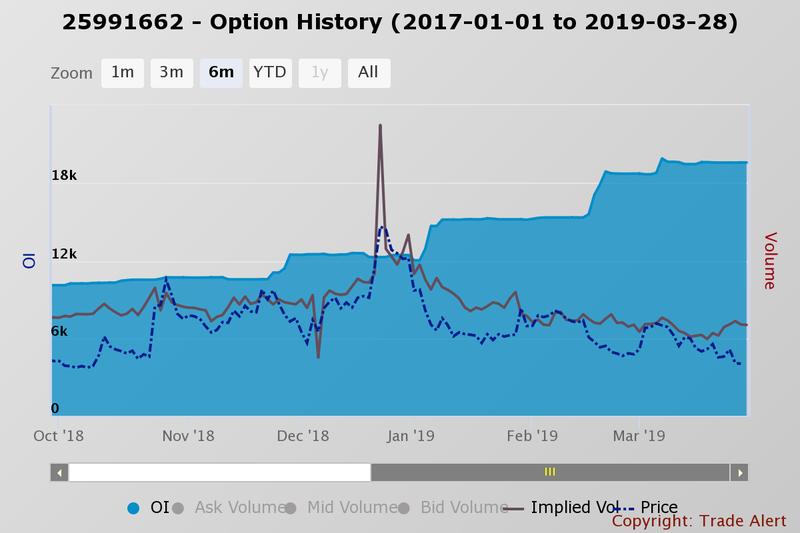 Should the stock be successful in rising above that zone, it could go on to increase to approximately $34.25, a gain of about 10% from its price of roughly $31.20 on March 28. Additionally, the relative strength index (“RSI”) is rising and is suggesting bullish momentum is moving into the stock. The RSI is currently around 60, and it would need to rise above 70 before the stock would be considered overbought. 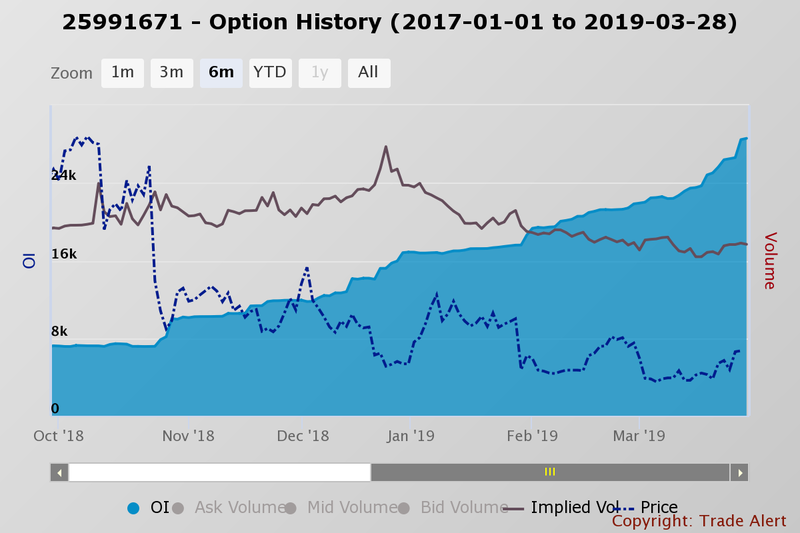 Additionally, there has been an increasing number of bullish bets placed in the options market. 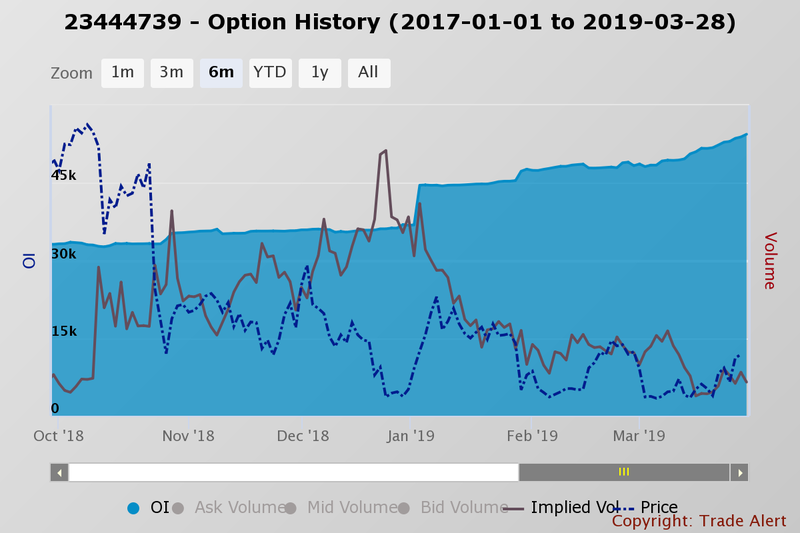 The open interest levels at the $32 call options for expiration on June 21 have risen to approximately 29,000 open contracts. 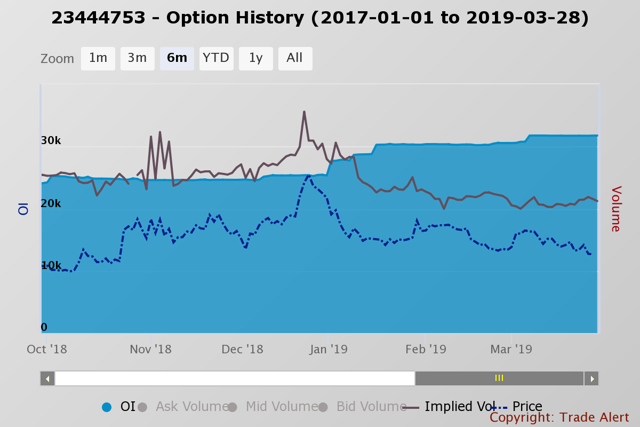 Meanwhile, the activity at the $32 puts have seen a fewer number of new contracts and have an open interest of roughly 19,000 contracts. The growing number call bets would suggest that traders are getting more bullish on AT&T and are more willing to bet that shares will rise over the next three months then fall. For a buyer of the calls to earn a profit, the stock would need to increase to around $32.60 by the expiration date. Additionally, the number of open January 2020 $33 calls have increased to 55,000 contracts. Meanwhile, the $33 puts have seen less activity and have leveled off at roughly 31,000 contracts. Pointing to more bullish bets being placed. For a buyer of the calls to earn a profit, the stock would need to rise to around $34, an increase of almost 9%. One other significant benefit that may act as a tailwind for AT&T’s stock is falling interest rates. As rates continue to drop, it is likely to make AT&T’s high dividend yield of nearly 6.5% desirable to investors seeking income. Should AT&T’s dividend rate fall, it would help to boost the stock price, given the inverse relationship. But that big dividend yield doesn’t come without risk and is nearly 400 basis points higher than the current 10-Year Treasury. The high dividend yield is a warning sign that the market is sending about the safety of the dividend or the potential for fewer future dividend hikes. The company currently has a cash dividend payout ratio of nearly 60%, much higher than what may be considered a comfortable level. There are still those legacy issues that surrounds AT&T. The most obvious is the loss of subscribers in its DirecTV unit and the performance of its Warner media unit as I have discussed in previous stories. Momentum is moving in a direction that suggests AT&T’s shares may continue to rise over the next few months. But that doesn’t mean it will be a smooth ride higher. I hope this gives a brief overview of how we are dissecting the markets daily. Sign up and get two weeks for free! Additional disclosure: Mott Capital Management, LLC is a registered investment adviser. Information presented is for educational purposes only and does not intend to make an offer or solicitation for the sale or purchase of any specific securities, investments, or investment strategies. Investments involve risk and unless otherwise stated, are not guaranteed. Be sure to first consult with a qualified financial adviser and/or tax professional before implementing any strategy discussed herein. Upon request, the advisor will provide a list of all recommendations made during the past twelve months. Past performance is not indicative of future results.